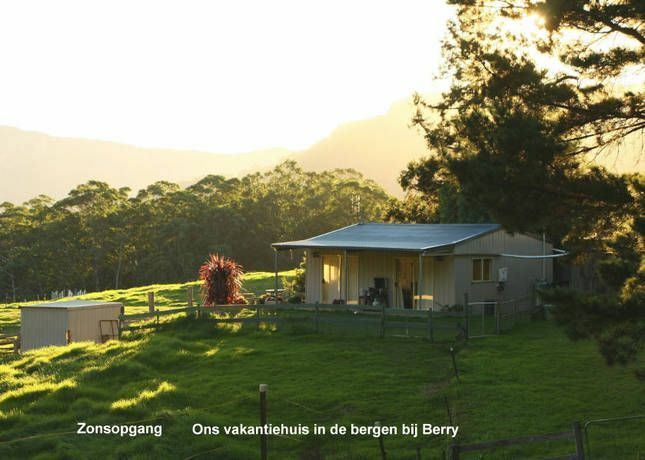 Small dog friendly cottage set in hilly country between Berry and Kangaroo Vlly. Well appointed accommodation with large bedroom and bathroom, kitchen-living room. Gas oven and hotplates, upright frig. Outside barbecue, hammocks. Dog friendly, can go inside! TV, DVD, CD player provided as well as lots of videos, books, games. Mobile phone connection for Telstra is 5 bars. No WiFi. Fully air conditioned, this little cottage is fenced off to allow for a small child or dog to run freely. Overlooking grassy paddock with cattle or ponies. Cottage is sometimes available as three nights for the price of two (mid week days only); single night stays accommodated at $200 as a last minute deal. Tariff does not include any provisions beyond tea, coffee, cereals. bed sheets can be provided for additional $40. Internet only available as plugin. Enjoy your meals outside when weather permits as we are lucky enough not to have a problem with mosquitoes and flies most of the year making this a pleasurable activity with views to die for. Drawing Room Rocks is a close walk with view over the valley and up and down coast from Wollongong to Jervis Bay, great picnic spot. Kangaroo Valley and Berry offer many variety shops and cafes for a relaxing day out but you would probably spend most of your time exploring this beautiful property with its rain forest gullies, spectacular views and many private corners to sit and meditate. Both Berry and Kangaroo Valley have galleries, antique shops, museums, outside dining areas - everything for the sophisticated - here you can experience a bit of nature as well as great dining and shopping.. Plenty of outdoor activities around the area, bush walks to Drawing Room Rocks, beach hopping, swimming, surfing, canoeing on the Kangaroo River. Winter features on the south coast include wine festivals, musicales, and more. We have cattle with calves, ponies to pat and more. We cater for small and large dogs - they are part of the family after all. The cottage is fenced off from the rest of the property so you can leave them for a few hours without worry. If you want to bring your horse(s), we spell horses in large grassy paddocks with automatic waterers next door to the cottage property.You can ride in one of the arenas (dressage or show jumping) or just trot around the rest of the property. (Conditions do apply). Lovely cottage with everything needed for a quite weekend away. Lovely surroundings. Saw lots of native animals, rainforests etc. Short drive to both Berry and Kangaroo Valley for a range of activities. Perfect, spotlessly clean and tidy. Very comfortable. enjoyed every moment of our stay, we will be back! The only thing bad about this place, is having to leave it! Amazing views, perfect for the 4 legged pet, awesome stay, and Penny is the best hostess! If you want peace and quiet and nature only this is it. thanks again Penny, we will be back soon! Toni and Bel and Oscar. Lovely quiet spot, nestled up in the hills. Sounds of birds and farm animals. The cottage is very spacious, tidy and clean. Everything you need is there. Idyllically located, the sound of nature surrounds you and it’s only a short drive in to Berry or Kangaroo Valley. Really loved the occasional visits from Boris the Staffy.